Britain's only real alternative to a "hard Brexit" is "no Brexit", European Council President Donald Tusk has said. Speaking in Brussels, he warned that the EU would not compromise on its insistence that freedom of movement will be a condition for Britain's access to the single market. 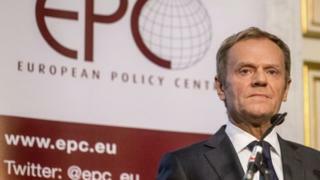 Mr Tusk will chair meetings of EU leaders negotiating Britain's exit from the 28-member bloc. In a 52%-48% vote in June's referendum Britain decided to leave the EU. Prime Minister Theresa May said last week that the government would trigger Article 50 of the Lisbon Treaty - beginning formal negotiations between the UK and EU - by the end of March next year. In his speech, Mr Tusk mocked a Brexit campaign promise that Britons could "have the EU cake and eat it too" - the idea that the UK might manage to keep trade benefits of EU membership while barring European immigrants and rejecting EU courts' authority. "To all who believe in it, I propose a simple experiment. Buy a cake, eat it, and see if it is still there on the plate. "The brutal truth is that Brexit will be a loss for all of us. There will be no cakes on the table. For anyone. There will be only salt and vinegar." Mr Tusk also suggested that Britain might ultimately decide not to leave the EU "even if today hardly anyone believes in such a possibility". The BBC's Damian Grammaticas in Brussels says this was Donald Tusk raising the alarm. He appears to be deeply concerned about the direction any Brexit talks could be headed, our correspondent adds. However, Mr Tusk again stressed that the choice would be the UK's alone to make whether Brexit "is really in their interest". British officials have so far made no public comments on Mr Tusk's latest statements.